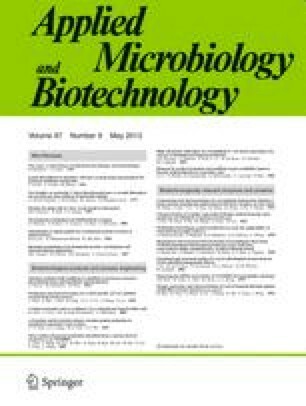 Protein-secreting procaryotic host organisms are currently being sought as alternatives to Escherichia coli for recombinant processing. In this study we examined how manipulation of the cultivation conditions can enhance heterologous protein production by Streptomyces lividans. The recombinant S. lividans used in this study expressed and excreted a Flavobacterium enzyme capable of hydrolyzing organophosphates. Initial shake-flask studies demonstrated that supplementing Luria-Bertani medium with moderate amounts of glucose (30 g/l), led to improved enzyme production. In fermentor studies with controlled pH, a further twofold increase in production was observed when glucose was fed continuously as compared to batch cultivation. This improved production in the glucose-fed culture may be related to a reduced accumulation of acids. Continuous feeding of both glucose and tryptone led to a further sixfold increase in production. In addition to enhancing production 25-fold, the efficiency of enzyme production and the specific activity of the excreted enzyme were also improved by glucose and tryptone feeding. These results demonstrate that in addition to genetic manipulations, optimization of cultivation conditions can lead to significant improvements in the production of heterologous proteins from Streptomyces.